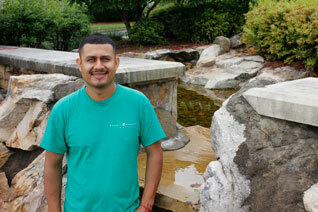 Antonino Martinez has been working in the landscape industry since 2008. Serving as our irrigation technician, Antonino installs, maintains and renovates our customers’ irrigation systems. He dedicates himself to incorporating new and efficient irrigation products as they become available in the market. As a result, the systems that he installs are cost efficient and effective. He employs his familiarity with pump and filter technology in servicing both water features and irrigation water supplies. He began his career working with his father’s fencing company, where he installed wood and metal fencing. He is a competent welder and is experienced in using tools and equipment for construction, mechanics and electronics. His training also includes landscape lighting installation. Antonino enjoys the comradery and the spirit of teamwork at our company, where he feels that roles are clearly defined, and expectations are thoroughly communicated. With a natural chain of command in a climate of fairness and structure, Antonino can visualize what steps he will take and what educational opportunities he will persue to enhance his offering to the company. Antonino spent his childhood in Texas. His family moved to Gainesville when he was in fourteen. Antonino is married to Miriam Liliana and they have a baby daughter, Leah Antonella. Antonino looks forward to growing with our company He looks forward to Learning and instruction.